The K2 2018 summer season has come to an end when the Austrian operator Furtenbach Adventures declared the weather window had closed and they spent too much time on Broad Peak thus missing their K2 opportunity. 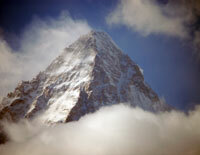 Overall, K2 saw over 60 summits – a record – by several different teams. As always with K2, there were deaths, two this year. K2 continues to play hard with climbers in all seasons. Early in 2018, a well respected Polish team gave their best effort to make the first winter summit but were denied. Blame the weather, or botched logistics or poor teamwork – whatever the reason the world’s second highest peak can go for years with no summits unlike many of the other 8000-meter peaks. According to 8000ers.com, plus my own research, from 1986 to 2016 there were 12 years with no summits. From 2009 to 2016, there were only three years with summits – 2011 only from the Chinese side by Gerlinde Kaltenbrunner. In 2012 and 2014 each saw about 30 – 50 people summiting – record-breaking years as a result of a week of excellent and rare summit conditions. Everest went from 1974 to 2014 with summits every year – 40 straight years! The best year ever for K2 before 2018 was in 2004 with 51 total summits followed by 2014 with an estimated 49 summits, including six female climbers – the same number of female climbers as this year! It seems the curse of K2 on female climbers has relented. With less than 10 teams hoping to summit K2 in 2018, the season began a bit earlier than usual with a high-profile Japanese team led by Akira Oyabe arriving in late June. They had been preparing for two years after not reaching the summit in 2009 and 2013. They were somewhat independent with no Nepali Sherpas and only a couple of Pakistani High Altitude Porters aka HAPs. They fixed the rope to C2 before heavy snows buried them leaving the rope fixing to highly supported commercial teams. As for the other four 8000ers; Nanga Pabart, Gasherbrum I and II, and Broad Peak there were only a handful of climbers, many small independent teams hoping to open new routes or repeat rarely climbed ones. There was also activity on at least nine other Pakistani peaks including Gasherbrum IV and Latok I. As we left June and entered July, the notoriously poor Pakistani summer weather turned downright ugly. The conditions were aptly summed up by Luis Stitzinger of the German guide company Amical alpin: “I’ve never experienced such a season with so constant bad weather in the Karakoram.” They gave up on their Broad Peak ambitions and went home by July 6th. Similarly 150 miles away in the Western Himalaya on Nanga Parbat, well respected climbers Mike Horn, Alex Gavan, Tunc Findik, and Maya Sherpa all ended their efforts fairly early into the season due to dangerous snow conditions. 2018 was beginning to look like 2015 and 2016 when no one summited K2 and only a few made the other peaks throughout Pakistan. There were sporadic days of good weather but not enough to allow teams to string together enough time at altitude to fix routes and acclimatize their bodies for the summit push. Usually the Karakoram season ends in early August so by mid July, it was looking bleak. Finally the first summit in Pakistan for the 2018 summer came when Austrian Hansjörg Auer posted on Instagram that he had made a historic first ascent, “… climbed the Westface of Lupghar Sar West.” His solo climb on the big wall of the 7,157-meter peak was in fact an impressive first. Then on Nanga Parbat, technically part of the Western Himalaya Range and not the Karakoram, Korean Kim Migon with support from Summit Karakoram made the first 8000-meter summits of the season. He persevered when other climbers gave into the conditions. This was Kim’s last 8000er. Just as the season seems to have turned around tragedy, often associated with climbing the world’s big peaks, struck. On July 7th, Canadian climber Serge Dessureault fell to his death on K2 near House Chimney as he was rappelling from Camp 2 during an acclimatization rotation. He was the leader of a small Canadian team. They soon canceled their expedition and returned home. Then over on Gasherbrum IV, 7,925-meters high, – a peak with several small and ambitious climbs planned for the season, Maurizio Giordano was hit by ice and died as he was descending on July 11th. He was part of an Italian Army team. They abandoned their expedition after his death. And Austrian climber Christian Huber died in an avalanche that hit his tent at Camp Two on Ulter Sar (7338 m) in Pakistan in late June. While not in Pakistan, the death was reported of Pemba Sherpa who was assumed to have fallen into a crevasse on Saser Kangri, the highest peak at ‎7,672 m (25,171 ft) in the Saser Muztagh Range, the easternmost subrange of the Karakoram range, located in India. He was with a team of climbers led by Basanta Singha Roy from West Bengal and another team from Pune, India. On the Gasherbrums, Masha Gordon and Helias Millerioux, Yannick Graziani made an attempt to traverse G1/G2 but stopped after dealing with unfavorable conditions. K2 skier, Andrzej Bargiel, who was acclimatizing on GII abandoned his plan as he didn’t like the dangerous conditions on GII. A Weather Break and Summits! Finally in mid July, the Weather Gods smiled on K2 and the weather forecasters gave the climbers a green lite to push fast and hard. Furtenbach Adventures decided to stay at Broad Peak and made a big push on July 15/16th. They made it this time putting four members, four Sherpas and two HAPs on top including semi-independent climbers Fredrik Sträng and David Roeske who didn’t use O’s. This was a big deal especially for Fredrik as he had been denied before. But this proved to be a costly decision to their K2 ambitions. On GII, Adam Bielecki and German Felix Berg summited GII while teammates Jacek Czech and Kazach Boris Dedeszko turned back. All climbed without supplemental oxygen or any kind of additional support staff during the climb. Luis Stitzinger summited GI on July 18th nabbing his eighth 8000er, all without supplement Os. A Czech team summited Nanga Parbat. With summits all over the Pakistani high peaks, only K2 had not been summited this summer. K2 Blitz and Another Death! However, with a good forecast, the K2 teams jumped on the opportunity. Led by the Kathmandu based and Sherpa owned guide company, Seven Summits Treks (SST), they put 24 people on the summit on July 21st made up of 10 members supported by 13 Sherpas and 1 HAP. This is becoming a familiar formula to commercialize K2 – a 2:1 member to support ratio and plenty of supplemental oxygen and wait for 4 days of good weather. This happened in 2014 and again this year when about 50 people summited. Also on July 21st, there were seven other people who summited taking the day’s total to 31. The next day, American operator Madison Mountaineering said they had 8 members, 3 guides, 9 Nepali Sherpas and 4 Pakistani HAPs summit. Again a more than 2:1 support ratio. However, the Japanese team summited the same day with 6 summits supported by two HAPs but their joy was shattered when Kojiro Watanabe, 41, fell to his death in the bottleneck. This was the second death on K2 this year and the fifth in the Pakistan Mountains for the summer of 2018. Mingma G Sherpa, who thought he had summited BP last year but later felt it was the fore-summit returned this year to make sure he got the absolute top, and he said he did this time. Sergi Mingote, not using supplemental oxygen, also summited Broad Peak this season, and then went on to get K2. His logistics were provide by Karakorum Tours Pakistan. Mingote is one of the rare individuals to summit both peaks with or even without Os in a single season. You can see his summit videos on his Facebook page. The last person to do it without Os was the late Boyan Petrov in 2014, who since died in 2018 on Shishapangma. At least five people summited K2 for a second time, including American Guide Garrett Madison and Fazal Ali shimshal who made his third summit. Noel Hanna and Jason Black became the second and third Irish to summit after the tragic story of my friend Ger McDonald in 2008. Fredrik Sträng and David Roeske who both had summited Broad Peak moved over to their prime objective, K2. They waited until the big rush was over believing they had a few days of good weather before the next storm moved in. They reached Camp 3 and were hit with unexpected strong winds and snow thus ended their attempt – a bitter sweet ending to a dream. This was Fredrik’s third attempt on K2. Adam Bielecki who was on K2 this past winter had targeted GII then GIV and GI but apparently didn’t get any of the due to weather and conditions. Dávid Klein and Hungarian Szilárd Suhajda were going for GII and GI but conditions stopped them. One of the more mysterious events that took place this year was the rescue of legendary British climber Rick Allen on Broad Peak. The short story is Rick left his teammates from a high camp on BP to do a solo attempt on a new route that involved climbing a steep ice wall. When he failed to return as expected his teammates assumed he had died and began to descend. Rick’s longtime partner Sandy Allan contacted Bartek Bargiel who was a using DJI Mavic Pro drone to film his brother’s K2 ski descent and asked if he could fly the drone over the area where Rick was thought to be climbing. He did and they sighted Rick. A call to climbers Fredrik Sträng and David Roeske at C3 was placed asking them to investigate the area to see if Rick was still there. They found Rick and along with help from Summit Climb Sherpa, Tendi Sherpa, Rick returned to base camp mostly unhurt. Perhaps if Fredrick and David were not on BP, Rick would have been lost, so a good decision in the end! This report from the BBC shows the moment the drone flown by Bartek Bargiel spotted Rick Allen on Broad Peak. Breaking News: There is an urgent and tragic situation unfolding on the 7,145-meter peak Latok I in Pakistan. Russian Alpinist Alexander Gukov is trapped at 6,200m not able to climb higher or lower. His partner Sergey Glazunov fell to his death while they were descending the peak. He has been at the same spot for five days. Helicopters have tried to reach him but poor weather has stopped them. His batteries have run out on his sat phone and tracking device. The rescue attempt will continue. Other climbers in the area including Andrzej Bargiel, Herve Barmesse and David Goettler have offered to climb to his rescue. Updates are here. Finally, I want to leave you with this video that Bilal Munir Sheik sent me taken from Pakistani Air PK451 as it took a deviation to fly by K2 on July 17, 2018. Look for K2 starting at 5:00 into the clip and Gasherbrum at 7:10. Amazing footage and rarely seen. Congratulations to all this season regardless of your result – you put yourself out there, gave it your best and for some, you will be back! Well done!! Amazing coverage Alan. And amazing videos. The skier certainly had some nerve. I have skied a bit off piste and know the avalanche danger it can cause so stopped. Am surprised he didn’t cause an avalanche. Or maybe he did. Phew! Is that very high, odd looking peak in the video, from minutes 4:57 to about 5:18, K2? It looks so formidable. Amazing that you were able to get that video from your sources.. Is it K2? Hi Mary, yes that is K2 in that section. Standing higher than the neighboring peaks … and steep!